KFC offers new Popcorn Crispy Chicken--fried chicken that's battered and breaded with actual bits of popcorn--over in Hong Kong. The limited-time menu item comes with a caramel-flavored sauce that you can drizzle over each piece for a caramel popcorn-like quality. 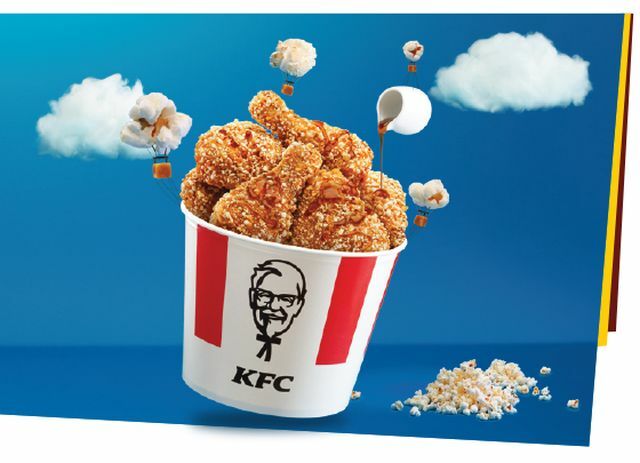 Continuing the theme, KFC introduces in a Caramel Popcorn Sundae as well. The sundae comes in a mini KFC bucket and features vanilla soft serve topped with caramel-flavored sauce and caramel popcorn. Photo via KFC Hong Kong.